It was around this time the sexual assault occurred. Plaintiff said her employer did nothing in response – there was no investigation and no additional protection provided. She’s now suing for Irvine sexual harassment, seeking injunctive relief and unspecified damages. It’s been at least a full year since shareholders at this company in particular have been voicing concerns about employee protection against customer harassment. 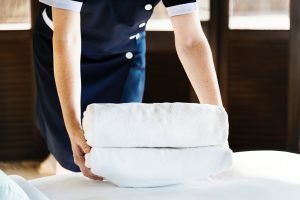 At a meeting last spring, eight other female hotel employees allege they had been harassed, groped and assaulted, and urged the company to take action. As her employment attorney explained, plaintiff was powerless to do anything herself; she couldn’t very well decline to clean the bathrooms. An executive of the hotel insisted the chain was focused on deterring and combating any and all harassment. Sexual harassment in hotels in California is nothing new. What’s risen the profile – and the voice of victims – in the last two years has been the rise of #metoo, which swelled after actresses in Hollywood, CA made public what until then had been an open secret regarding the alleged sexual predation of studio executive Harvey Weinstein. These kinds of incidents, though, were never just insulated to the mansions of movie producers. Hotel workers have been especially vulnerable to workplace harassment, according to the U.S. Equal Employment Opportunity Commission, which found more than one-fourth of all complaints of sexual harassment came from within those service industries in which there was a high number of service sector workers. Employers – such as hotels, restaurants, cruise ships and others who employ service industry professionals – have a legal duty to protect their employees from customer harassment and assault. When they do not, it can be grounds for civil litigation through an employment lawsuit.